I did this painting to show my appreciation for the support that my auntie Norma and uncle Allen have given me. I graduated from high school June 2010. As I crossed the stage to receive my diploma, I thought of the people who have always been there for me. My auntie, my mom’s sister, and uncle immediately came to mind. They have been my second parents since the moment I was born. When I graduated I knew I had to do something to show them how truly grateful I was to have them in my life. They have admired my artwork for years and mentioned a few times that they would like me to paint something for them. Finally, with my summer free before I left for University, I had the time to paint something for them. 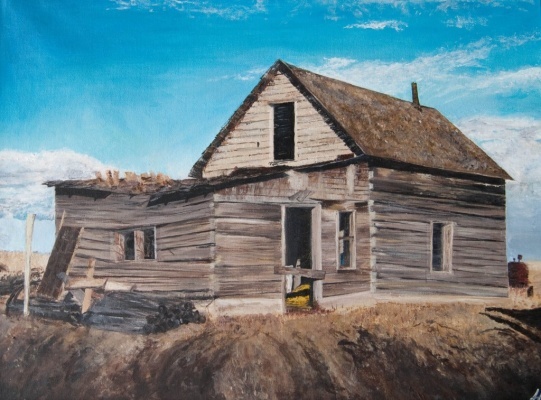 They asked if I could paint a picture of an old house that is an important part of my uncle’s Metis heritage. My uncle sent me a photograph of the house, and a detailed letter about the history of the house based on his extensive Metis genealogical research. This house was my uncle’s great-great grandfather, Raphael Morin Senior’s, second house. This house is still standing on its original location at Morin Lake, Victoire, Saskatchewan. The house was on the Carlton/Green Lake trail [Métis historical trail], three miles away from the Hudson Bay Company’s Shell River/English River trading post. Raphael first settled on this land in 1880 and according to Raphael’s last will and testament, this house was built in 1903. At one time, Raphael, his adult children and their families all lived in the area. My uncle’s mother is Lorraine Morin and her mother was Mary Beeds, who was born in the house. At 90 years old, Mary returned to the homestead for a last visit because as she said, ‘I loved that place so much’. The history behind the house is what truly brought the painting to life. As I painted this old house I was taken aback by how beautiful it was; it had character and uniqueness even though it was old, run-down, and partly burned. The house is a reminder of the importance of family, home and our Métis history. These are not only of great significance to my uncle, but also my own life, as my mother is also Cree and Metis from the same area.